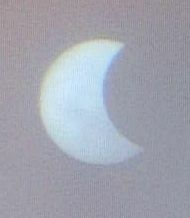 This eclipse, annular in Portugal and North Africa, was the 4th annular eclipse of the 21th century. 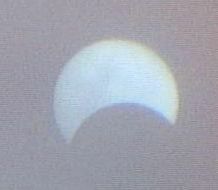 This partial eclipse was visible at maximum at 11 a.m in Paris. Fixing a Webcam on an astronomical refractor equipped with a filter, they have observed the Sun eclipsed by the Moon. The visualisation of the data has been done with the SalsaJ software. This has been possible thanks to the work of our Polish partners, who have developed the Webcam plug-in. This work enables to use the Webcam to easily obtain images ( .jpg) and movies (.avi).